When it comes to a nice decorative piece of furniture, the finish is everything. Even if you select the best wood with the prettiest grain and the perfect thickness, a bad finish can still ruin the look of the finished product and make all your efforts into a waste. While there are many other options such as oils, stains, or the various lacquers, polyurethane is the one that does it all. There is virtually no purpose for which it is not sufficient. The following five types of polyurethane are judged to be the best clear coats for kitchen cabinets on the market. So, without any further delay, let’s take a look. General Finishes is one of the most trusted and well-known brands on the market of wood finishes. This topcoat has many sheens including satin, gloss, and semi-gloss which are desirable for a lot of applications including kitchen cabinets of course. When you really want a high level of shine, a gloss will do the job. You could even use a buffer and obtain a higher shine, but that’s a lot of unnecessary work. One thing I like about this coating is that it contains a UV stabilizer that keeps the suns’ ultraviolet rays from breaking it down. This is very good quality for outdoor furniture pieces such as deck chairs or patio tables. For anything made of wood that is intended to be kept outside, this would be a decent option. But it’s intended only for interior use and the durability of this clear coat is very useful while finishing kitchen cabinets: it delivers a tough, high-grade finish that can withstand harsh conditions and scratches for a long time. I can say that this finish focuses on durability more than any other single feature. In fact, it is quite obvious that protective applications were the top priority when this product was invented. My advice for this clear coat is to use it for applications that require strong protection of clear finish. Rust-Oleum is one of the most trusted names in paint, and it shows when we look at this product. This is a crystal clear gloss, making it perfect for those applications that require perfect shine and maximum glossiness. This makes it a great choice for a nice piece of high-quality wood furniture. When it comes to cabinets, this is a great choice because its crystal-clear nature will bring out the natural beauty of the wood. That being said, you should probably stain the wood first before applying this clear coat. It is so clear that it may look too plain and unfinished after coating. By combining a light stain with this clear coat, you can obtain maximum beauty and a finish that will last a long time. This finish is water-based rather than oil-based, which means that it will dry both faster and harder. Some people prefer an oil stain because it will darken the wood and bring out its natural tones a little more. However, that harder coating will be much better for surfaces like hardwood floors that take a lot of scuffing. In terms of price, this is the cheapest coating in this top five. The only thing I don’t like about this one is its thin consistency, which makes it a little harder to apply multiple coats. This is a very common product that most home improvement professionals will be familiar with. One of the best things about this one is the fact that virtually everyone has used it at some point or another. It is available in a spray-on version, which is a favorite version of a couple of friends of mine, but a spray can just doesn’t allow for the same precise control. 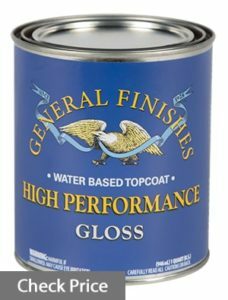 This clear coat is formulated for fast drying, and it delivers in that department. A second coat can be applied within only a few hours of application. As this finish is pretty thin, it can be a little hard to apply to some surfaces. You may have to apply thin coats to keep it from running. It has about the consistency of maple syrup, and so it is best to apply it with a few used dryer sheets. Make sure that you shake out the dust and debris before use. This is another water-based finish. That is a good thing because water-based coatings produce a harder surface and a much faster drying time. This coating is also formulated for low odor. It’s great when you happen to be working in a tight space. 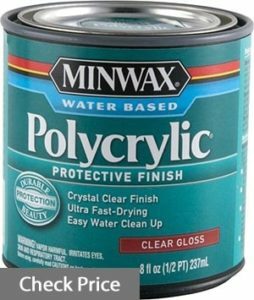 All those properties make this poly a great option for your kitchen cabinets. As a final bonus, this clear coat is really easy to clean up with warm water if you happen to spill it or get it on your hands. If you are looking for something nice to finish your cabinets, this is a clear coat that is designed for maximum durability. Like our first choice, this one is well-suited for outdoor use. It has UV blockers in the mixture, much like our first choice. This keeps the suns’ natural rays from breaking down the polyurethane and making it peel away. But unlike our first choice, this finish goes a little further. 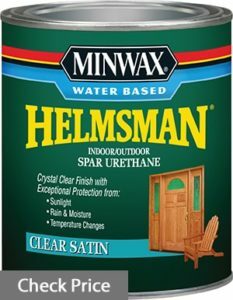 The Helmsman product is a little cheaper than the General Finishes, but it is actually more durable. Not only is it meant to resist UV rays, but it is also formulated to resist a wide variety of weather conditions. If you live in an area that experiences extreme heat or extreme cold, this is a good choice because it does a good job of resisting both. It’s a nice clear coat for kitchen cabinets if you want to get decent durability and protection. Although this is not an oil-based coating, it does contain special oils. Trey allow the entire finish to expand and contract just as the wood itself expands and contracts. This is the main reason that this coating is so superior for extreme heat and cold. Wood will naturally flex with the temperature, and if the paint and coatings do not flex along with it, they are likely to flake off over time. This finish is the odd duck on our list, mostly because it is meant to be wiped on with a cloth rather than being painted on with a brush. This makes a little bit of a difference in the look of the final product. One thing I really like about this coat is the fact that it is available in either full gloss or clear satin. This means that if you want to variate the textures of your finish, you have more than one choice. 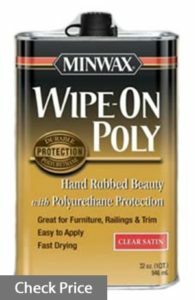 Products like this exist because some people really like that hand-rubbed look and this appearance only comes from the wipe-on products. One little issue is that a wipe-on poly will never be applied quite as thickly as a paint-on finishes. However, for some purposes, a thin finish is just what you want. 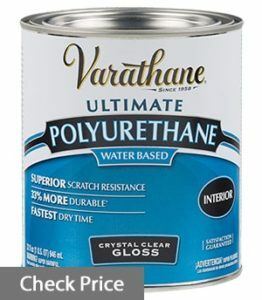 I have found that this kind of polyurethane is optimal for porches, railings and cabinets. There are certain instances where you want to preserve the natural grain of the wood. For instance, a handrail next to the stairs will need to have a good texture so as to provide a good grip. A one hundred percent smooth staircase railing would be pointless, as it would be rather difficult to get the traction needed. This is an oil-based coating, which makes it different from the others on the list. It will definitely take a lot longer to dry, so make sure you plan for the extra time. Also, an oil-based coating will form a slightly softer surface. This also makes it ideal for surfaces that will regularly be gripped such as kitchen cabinets handles. All in all, this one would definitely be the best choice for safety applications. Of course, there is another thing to consider about an oil-based clear coat. An oil-based clear coat will slightly darken the wood when it is applied. While most of our choices on this list are water-based and thus crystal clear, this one almost functions as a stain on top of its normal protective function. If you have a surface that requires a little bit of darkening, this one would be a great choice for your kitchen cabinets. For the purposes of this article, we didn’t attempt to look at every single kind of finish that you could use for your kitchen cabinets. To do that would be a very large endeavor, and would be outside the scope of this article. Instead, we’ve focused on polyurethane-based finishes. I have chosen to do this because polyurethane is probably the best choice for general use. 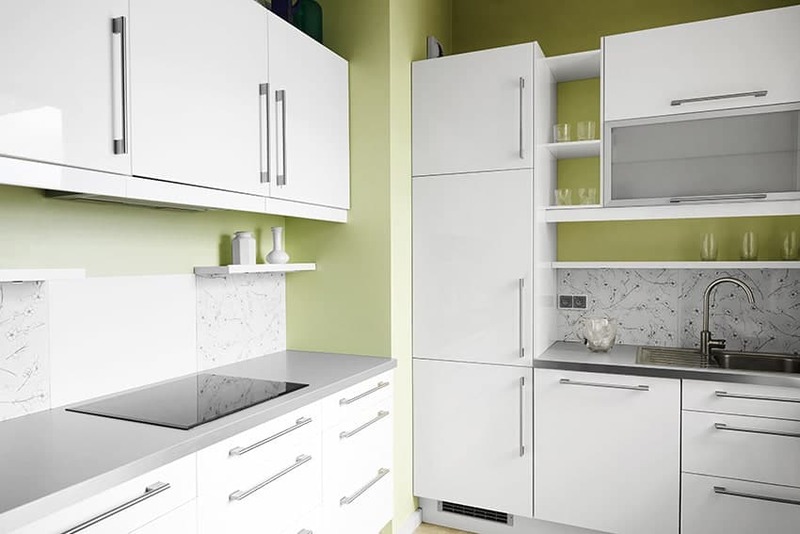 Whenever you are trying to choose the best clear coat for your kitchen cabinets, you need to carefully consider your needs and expectations. Think about exactly what you want your final result to look like. It would be virtually impossible to judge any one of these products as being “the best.” This is because all of these coats are meant for slightly different applications and situations. This means that I cannot make your decision for you. However, I am willing to unequivocally assert that choice number one, the General Finishes, is better than choice number four, which is the Helmsman. This is because both products are similar in terms of their function and strong protection, but the first one is much more time-tested. The General Finishes coating is able to withstand a wider variety of conditions and temperatures but at a slightly higher price. 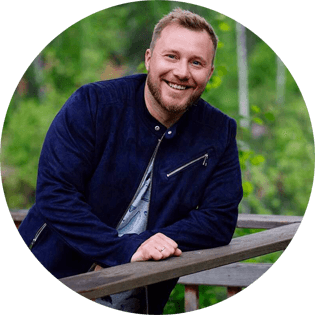 Any time you have a product that does more job (and better job) even though with more cost, it is sure to be a superior choice. For a set of kitchen cabinets, you need to think about what they already look like. For instance, if your kitchen cabinets are totally unfinished you should probably opt for an oil-based finish just so you can get rid of that “raw” look and protect it from weathering at the same time. If you don’t choose an oil-based coating, you will need to stain your wood before applying the clear coat, which means more time and trouble to get the job done. You should also consider the method by which the coating will be applied. Extremely thin coatings can be a slight problem to apply with a brush. This is because they have a tendency to run off the brush and drip from the surface as you are trying to apply the coat. This forces the user to use thin coats, and this, in turn, forces the user to do more coats. In short, it means a lot more time and a lot more work. Do not forget that considering the texture (sheen) is quite important. Gloss, semi-gloss, and satin are the three most common choices, and each one has a different level of smoothness. In general, rougher textures are better-suited for any surface that will regularly be in contact with hands or feet. A hardwood floor should definitely not be treated with a full gloss, as this will make it easier for a person to slip and fall. As we already mentioned, handrails (and all things that are meant to be gripped) also need a rougher surface for maximum safety. In conclusion, it is very important to choose the right coating for the right job. This is one of those products for which every type seems alike…until you look more closely and realize that there is a high level of planning and intelligence that goes into the design of these products. Remember, every paint company has at least one person who is paid to come up with scientifically formulated recipes. As such, every finish is different. I hope that this article has been both informative and interesting and that you are able to find the best clear coat for your kitchen remodeling needs.